Spring is officially here, and before you know it, summer will arrive. Hopefully you’ll be able to spend some more time outside over the next few weeks, enjoying the Kansas sunshine and warmer temperatures. At Accent Lighting in Wichita, we love the spring and summer because it gives us the opportunity to help customers find new exterior lighting for their homes and businesses. If you’re interested in choosing new outdoor lights this year, then visit our showroom today. We have a fantastic selection of fixtures! While some people love to travel during the summer, there might be nowhere else you’d rather be than at home. If you enjoy spending time outside during the warmer months of the year, then it’s important to have the right outdoor lighting for your home. Everything from the porch light by the front door to the pathway lights leading to the gazebo in the backyard play a role in the comfort and ambience of your home in summertime. When people come over in the evening for a barbecue or to simply hang out, you want them to feel welcome. New outdoor lights will show off your house in new ways, and guests will feel invited as they pull up to the curb or park in the driveway. Outdoor lights also provide safety and security, so when you’re outside in the summer and the sun has set, you can see where you’re going and your property can feel more secure. Guests can easily make their way to or from the front or back door, and any lights on timers or sensors will deter trespassers once you’ve gone to bed. Spring and summer might be a profitable time for your business, especially if you own a storefront or restaurant on a small town main street. People who are visiting, as well as local citizens, are more apt to shop and dine out during this time of year, which means your business could see more foot traffic. If you’re open after the sun has gone down, then it’s essential to have the proper exterior lighting. You want people to be able to find and identify your business, and having a light near your company sign will let guests know that they have arrived. 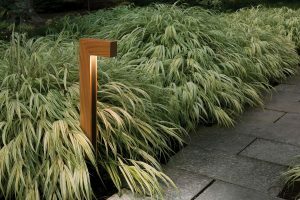 If you have sidewalks and landscaping around your store or restaurant, then you can accentuate any unique features with ground-level and other fixtures. We know that we’re excited for summer to get here, and we hope that you are as well. If you’re thinking about adding new outdoor lighting around your home or business, then please stop by our showroom today. With our selection of exterior fixtures, you can discover new styles that fit your new design vision. Our expert staff will gladly walk through your lighting layout with you and answer any questions you may have. When you’re sitting outside this summer or welcoming your guests to your business, we want your lighting to be a primary part of the ambience. It can help set the tone for someone’s experience, whether they’re coming over for cocktails or plan on shopping in your boutique.